Make over crispy latkes and fresh-baked babkes with sweet and savory spins for a delicious Hanukkah celebration. Jewish food and lifestyle expert and founder of JamieGeller.com, Jamie Geller is joining TODAY Food to share a few of her favorite latke and babka recipes just in time for Hanukkah. 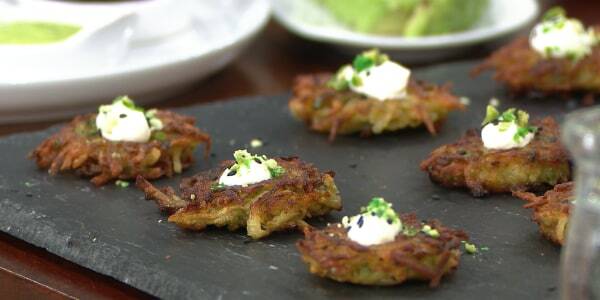 She shows us how to make crispy wasabi pea latkes and basic babka that you can customize with your choice of fantastic fillings. Peel and/or shred potatoes and keep in a bowl of water in the fridge for a few hours or overnight. Prep latke batter and keep in a sealable container in the fridge for a few hours or overnight. On the day you're going to eat the latkes, fry and keep at room temp. To make them a few days before, fry, let cool and freeze. From room temp or frozen, rewarm on a foil lined baking pan, in a single layer in a 400°F oven. Do not to refrigerate fried latkes, unless you like 'em soggy. Be your own sous chef. Have all ingredients prepped and measured and ready to go (this can even be done the night before and stored in the fridge in sealable containers) to make assembling latke batter a breeze. 3, 2, 1 + season. The perfect latke ratio is 3 large russet potatoes to 2 eggs to 1 small onion. To season, start with a generous pinch of kosher salt and skimpy sprinkle of pepper or your favorite spice. After mixing, fry up a tester latke, taste it and adjust seasoning as needed before frying the rest. Matzo meal or flour? It is up to you and your tradition. Matzo meal yields a crunchier latke, while flour makes them fluffier. Use 1/2 cup flour/matzo meal to the 3, 2, 1 ratio above. 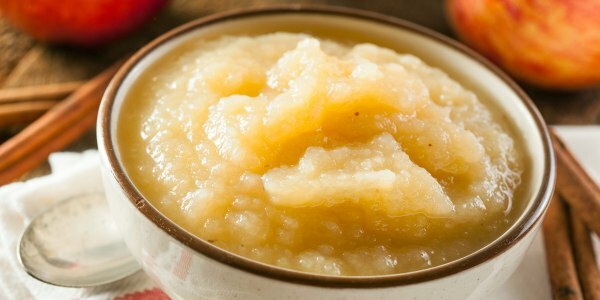 Using a clean kitchen towel or cheesecloth, squeeze all the excess moisture out of the grated potatoes and onions. This will prevent any sogginess and keep latkes crisp. Fry at the right temp. The perfect fry temp for latkes is 350°F. Don't have a deep fry thermometer? No problem, just use a wooden chopstick or handle of a wooden spoon. Place the end in the hot oil and when it bubbles, your oil is hot and ready. Drain latkes on a paper towel lined plate and keep warm in a 200°F oven to make sure they stay crispy until you're ready to serve them. Latkes that are the same size, cook at the same rate, and are more attractive on platters. Find your perfect size by using a 1/4-cup measuring cup or a cap from a canning jar. Pack the lid with latke batter and gently overturn it into hot oil. Continue with remaining batter, in batches. Each latke will be the same size and you will look like a pro! 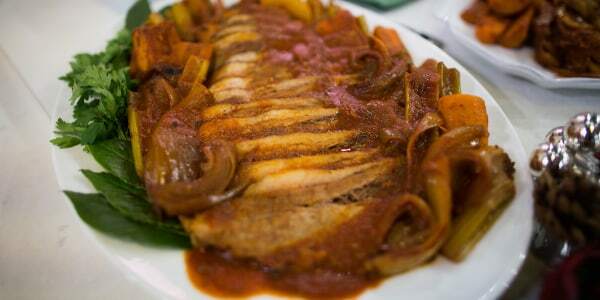 This perfect party app is an exciting, unexpected mash up of Jewish and Asian cuisines. The flavor combo is beyond delicious! I love this recipe because it's beautiful, delicious and lends itself to so many fillings it can be customized to your heart's desire. 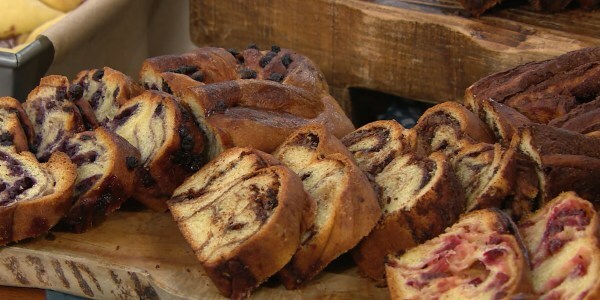 It's a foolproof, fluffy babka that can accommodate whatever you have in your pantry, sweet or savory. Chicken, olives, halva, meat, or chocolate can all make their way into a babka.